Voici plus d’un an que nous vous avons sollicité pour notre projet «Sharing a Child’s Dream» et nous sommes fiers de vous l’annoncer enfin: Le court-métrage est terminé. Rentrés en mai, nous avons travaillé jours et nuits pour finir ce court-métrage. Vous allez rencontrer 22 enfants de 15 pays différents! Nous tenons encore une fois à remercier chacun d’entre-vous pour sa participation! Sans vous, notre projet n’aurait pas pu prendre forme! 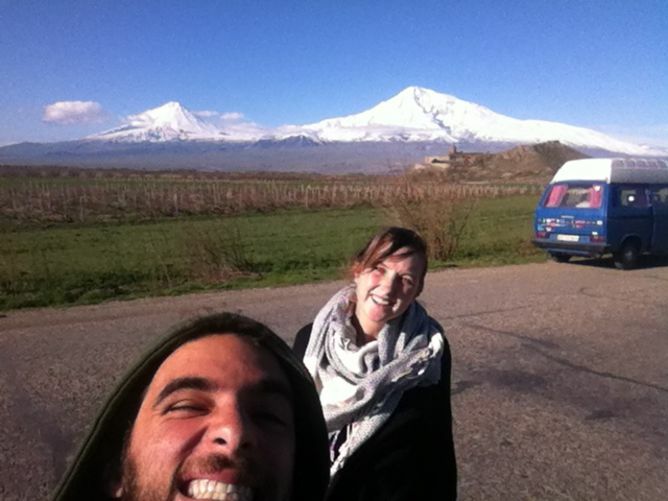 After 9 months on the road, we arrived in Armenia, our last stop.It has been an incredible adventure!! Now it is time to start the journey back to Switzerland and therefore, in about three to four months, our short film will be finished! We definitely haven’t forgotten you all. Some of you have already receive their rewards, and for some, it is on the way! We can’t wait to share our adventure with you! In the meantime, take care and smile! Apres 9 mois sur la route, nous avons atteint notre but final: l’Armenie!Ce fut une aventure incroyable! Maintenant, il est temps de prendre la route du retour. Notre petit court-metrage sera donc pret d’ici trois a quatre mois! Ne vous en faites pas, nous ne vous avons pas oublie! Certains d’entres vous ont deja recu leur recompense, et pour les autres, elles sont en route! Nous nous rejouissons de pouvoir partager notre periple avec vous tous! D’ici la, tout de bon a vous! Apres avoir traverse l’Angleterre, les contrees sauvages que forment le pays de Galle, le pays de la Guiness et des lutins qu’est l’Ireland et apres avoir dit bonjour a Nessi en Ecosse, nous voici sur le chemin pour la Norgeve! Le court metrage prend gentillement forme et nous sommes en train de collecter tout ce qu’il faut pour vos contributions! Alors ne vous en faites pas, on ne vous oublie pas! En esperant que tout se passe bien chez vous! WAHOUUUUU we made it! And this thanks to you all! So we wanted to thank you all so so much for your support! 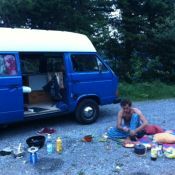 Here we are on the road since a month now! we have been through France, and up to England, and we are now heading off to Ireland and then back to the European continent! And now, thanks to you, we are going to be able to realize this short film and we can’t wait to get started! So thank you for your support and your great generosity, we were so touched! You will receive your rewards during our trip, and the short film will not be finished until we get back from our travelling, so don’t worry you will not be forgotten and we will let you know when we get back from our travels! YOUPIIIIIIII voila on a reussi !!! Et ca grace a vous! Alors on voulait vous dire a tous et a toutes un gros gros merci pour votre soutien! Nous voila deja sur la route depuis un mois, nous avons traverse la France jusqu’en Angleterre et nous nous appretons a aller en Irelande avant de revenir sur le continent europeen pour continuer notre route! Grace a votre aide, nous allons maintenant pouvoir realiser ce projet de court metrage et nous nous en rejouissons enormement!! Merci pour votre soutien, votre generosite et votre bon coeur! Vous etes des gens en or! Vous receverez vos contreparties durant notre voyage et le court metrage ne sera pas acheve avant la fin dudit voyage, c’est-a-dire pas avant 6 a 8 mois! Du coup ne vous en faites pas, nous ne vous oublierons pas, c’est promis! This project ended successfully on 24/8/2014 15:00! You will receive a postcard from one of the countries we will be travelling through. You will receive a unique polaroid picture of our trip with a local surprise from one of the countries we will be travelling through. You will receive a local cooking recipe, an album of traditional music and a local surprise from one of the countries we will be travelling through. You will receive a scrapbook of our trip with a dozen polaroid pictures. This book will concentrate on the kids we will be interviewing for our short film. If you live close-by, you are invited to attend our movie premiere in the local cinema of the Vallée de Joux (Switzerland). You will have the honor to meet the editing and filming crew, i.e. us, this while sharing good Swiss wine and cheese. You will receive in exclusivity a DVD of our short film. Your name will appear in the credits. You will also be invited for a meal in a Swiss Chalet. You will receive a scrapbook of our trip, a local surprise from a country we will be going through and a special surprise day with us! Your name will also appear in the credits. Her: A 20 years old with a background in Film and travel. Him: A 23 years old, budding engineer who has spent prolonged periods in Burkina Faso.